The charms of Los Altos are many. I’ve long contended that out of the two hundred plus Mexican restaurants in Austin they put the finest, gratis, chips and salsa on the table. A smiling Mexican girl is the delivery system and that’s a nice bonus in a city overrun with maitresses [ male waitresses ]. The red is utterly basic and utterly delicious. Lots of fresh chiles, good quality canned tomatoes and plentiful onions and lime juice. The green is somewhat unusual. It’s a very fine purée with the most prominent ingredient being vinegar. It’s bracing and provides a beautiful foil to the rich Jalisco-style meats. They also provide the best Mexican meal for under $3 in town. Their tostada clocks in at $2.71 tax included and is a mountain of food. A thin, fried corn tortilla round is topped with multiple layers of refried beans, lettuce, tomatoes, avocados, meat of your choice, sour cream and a half pound or so of freshly shredded queso blanco [clearly shredded per order]. But we are here to discuss barbacoa and unfortunately Los Altos doesn’t deliver the goods in this crucial category. At $1.73 the taco is priced appropriately but the flavors are simply not there. A sign outside boasts handmade tortillas which I find odd. 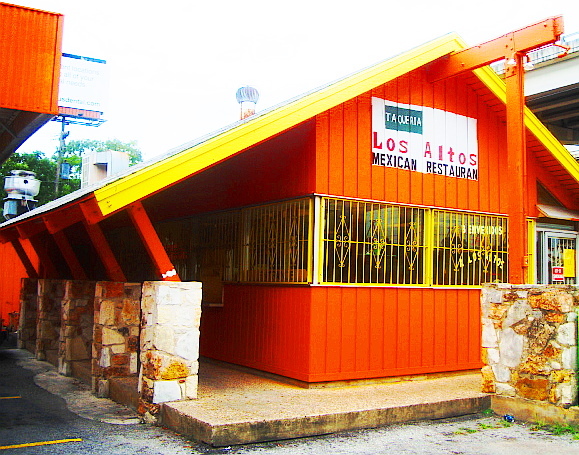 I’ve eaten at Los Altos dozens of times and have never eaten a handmade tortilla there. They use the commercial brand Fiesta [not affiliated with the supermarket] and they’re edible, grade b, mass market style but nothing more. The portion of barbacoa is small by taqueria standards, nicely rippled with fat but oddly flavorless. The rich, musky notes of good head meat from a freshly butchered cow are missing. I doctor the taco with the red salsa and a squeeze of lime and it eats. Barely. A good love affair is not, however, to be interrupted by one wayward dish. A mediocre barbacoa will not dissuade me from my regular patronage of Los Altos. They have one of the best carne guisadas in town and their carne asada is also very fine. I may return there later this evening and try the goat, a recent addition whose presence is trumpeted by signs taped up all over the restaurant.